Today on board the Cetacea for the 9am whale watch, we traveled to the northwest corner. We did some searching and came across one single humpback whale. This individual was traveling quickly and taking long 8 minute dives. It never fluked for us, but after talking with the 10am whale watch, we positively identified the individual to be Rapier. Next we traveled over to check out a pair of humpbacks in the area. It was Northstar and Hippocampus. The pair was moving slowly and taking short non-fluking dives. On the 1:30 trip, we went back to the northwest corner. The wind started to pick up which made searching a little tougher. After a couple minutes of scanning, we found Northstar and Hippocampus again. The pair was doing some longer dives, ranging from 6-11 minutes and doing both fluking and non-fluking dives. 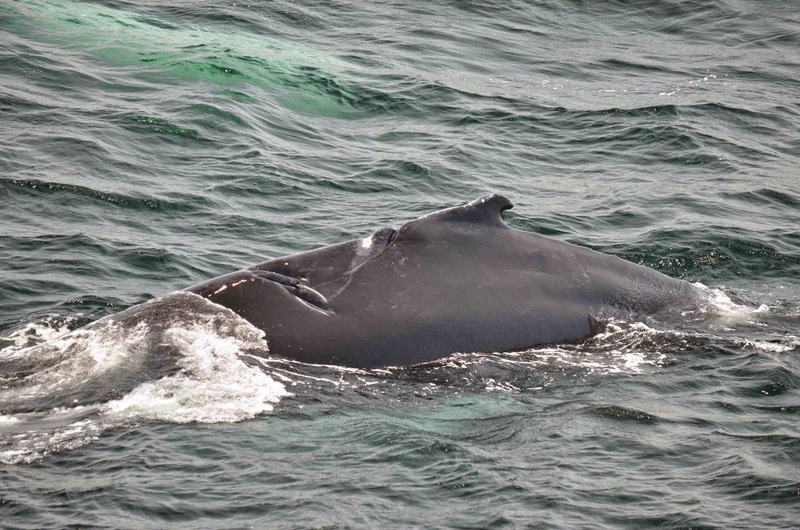 While the whales were down on a dive, we saw a large bait ball at the surface. The whales were probably taking some longer dives to feed on all the prey in the area. On today’s 10am whale watch about the Asteria, we headed towards the bank, first arriving on the western edge along mid-bank to find female humpback Rapier. Rapier was traveling in the area and not fluking much, but she did grace us with one look at her tail. She gets the name Rapier because of the line on her left fluke that resembles the French term “Rapier,” a thin, sharp-pointed sword that was used for thrusting in swordfights. A cloud of morning whale breath—yummy! We then left Rapier and headed to the NW corner to find our pair of the month, Northstar and Hippocampus. At first these two were traveling slowly and doing some subsurface feeding. We also got “snarged” by Hippocampus – everyone on the bow and second deck felt the wet smelly breath, including our captain Joe! As time started wrapping up for our final looks, Hippocampus stole the show by making some powerful repeated inverse tail breaches! It was fun to see how Hippocampus was making its own “tidal wave” each time it surfaced – its flippers would be outstretched to the sides as the tail came up. Hippocampus also display some upside-down lobtails and tailslaps too before we left! It was an exciting end to the trip, and a beautiful day on the water. We had our two regulars out and about today on the bank, Hippocampus and Northstar! After feeding quite a bit yesterday, this duo spent most of today’s trip logging. Hippocampus was active a few times and even gave us three separate tail breaches which was very exciting for passengers! 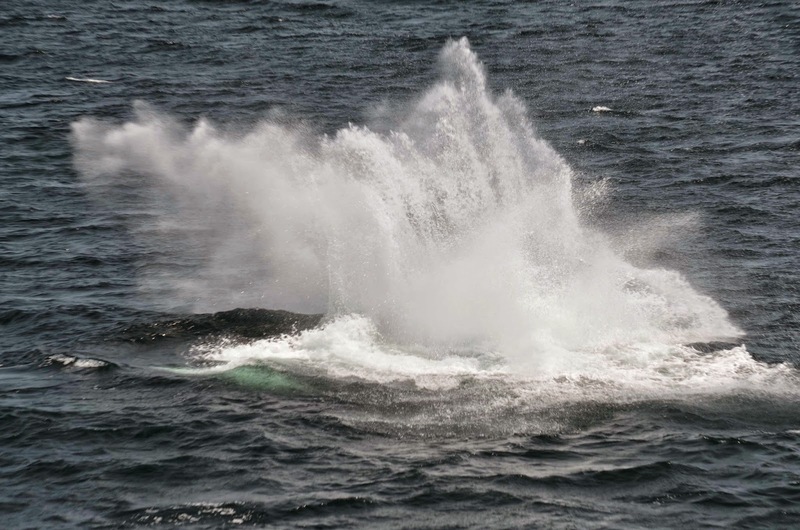 I captured literally the tail end of one of these breaches which was mostly just a huge splash! As Northstar injuries heal, we will continue to document it’s progress! Take a look at these photos of the wound which appears to be healing well!